Among the best remembered, and not for outstanding quality, are a trio of superheroes named after old movie monsters — Frankenstein, Werewolf and Dracula. Dell's first Dracula comic was a 1962 Movie Classic, based on the Bela Lugosi feature. Its second came out four years later, and was about a modern-day descendant of the Lugosi character. Dracula #2 (November, 1966) introduced the current Count Dracula, still living in the same old castle, where he spent his days conducting medical experiments on bats. Even as he was freeing his furry-winged little pets, their service completed, he accidentally ingested his own chemical and thereby gained the ability to turn himself into a bat at will. Realizing the superhero potential of such an aptitude, he embarked on a body-building program, had a tailor make him a set of bat-like tights, and bribed the tailor lavishly never to mention the incident. It wasn't until the second issue (i.e., #3) that Dracula adopted his secret identity, Al U. Card. He needed a name nobody in a million years would ever spell backwards and thereby connect with Dracula, because superstitious peasants had just burned his stone castle to the ground (which he took as his cue to emigrate to America) and he had no other way to operate in secret. 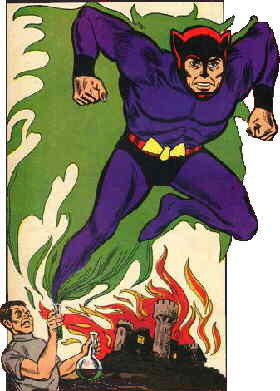 Like Dell's other superhero monsters, the Dracula series was drawn by Tony Tallarico, whose idiosyncratic yet uninspiring artwork is also seen in several series for Charlton Comics, such as The Blue Beetle and Son of Vulcan. The script has been attributed to Don Segall, who also wrote Dell's Kona, Monarch of Monster Isle series, but Segall's connection to these comics has never been definitely established. Dracula got his sidekick, Fleeta, in #4, when his lab assistant, B.B. Beebe, learned his secrets and got super powers of her own. But the dynamic duo of Dracula and Fleeta didn't last very long, as that issue (dated March, 1967) was the final one. The series was reprinted in 1972-73 (possibly in an attempt to ride the coattails of the Marvel Comics version of Dracula), and this time the three issues were numbered 6 through 8. What became of #5 is unknown. Text ©2003-06 Donald D. Markstein. Art © Dell Comics.